Reviewing for children or young people isn’t about one’s own reading habits. This time, the reader in mind isn’t a fully-grown woman in an armchair with a mug of good coffee and a couple of chocolate biscuits. The reader I’m searching out books for is a certain seven-year-old. She borrows the popular series titles from her local library – while it still exists – but I like to offer her stories that are a bit different and possibly a little less girly. Now I’ve found a storybook that she might like – and certainly I enjoyed it. 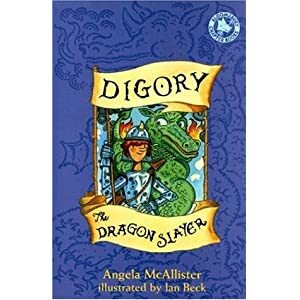 Digory The Dragon Slayer by Angela McAllister is told with a strong, true storyteller’s voice. Timid lute-player Digory discovers a dragon’s tooth in the river bank. Unwisely, he sets it in his hat. As a result his proud village, without asking too many awkward questions, sends Digory off to find fame, fortune and more dragons to slay. Riding on Barley, his faithful horse, Digory avoids several huffy princesses before arriving at the castle of forgetful King Widget. Here Digory meets Princess Enid - she of the hodge-pig hair and tree-climbing skills – and they become such good friends that King Widget invites Digory to be a Prince. Digory happily agrees which is when Widget remembers Digory has to fight a dragon first. Our hero sadly sets off on Barley away from any dragon but his poor sense of direction sends him into a dark and troubling tunnel, facing his doom. A happy ending arrives, but from a most unexpected source. I felt McAllister had fun weaving her unexpected twists into the story but what made it a real delight to read was her playful use of language. Digory even, at his most “shiverous” moment knows he is “one boy alone who doesn’t know how to slay a sausage”, while down in the dragon-filled tunnel there’s a boasting contest I'm sure will be great fun to read aloud. There are gentle jokes, pace, action and just enough gruesomeness for the folk-story genre but how refreshing - if that’s the right word – to find a book that doesn’t use snot and poo in an effort to be exciting. Design-wise, the layout is attractive, the font clear and there are plenty of b&w illustrations by Ian Beck. Even more helpfully for the young reader, the nine chapters are divided into easy to enjoy mini-chapters so the reader feels as if the author is there, telling and explaining the tale. So I am hoping, though the hero is a boy, a certain story-loving girl will enjoy it, and enjoy having it read to her. And there’s even a DIGORY and THE LOST KING as a second helping. Edition & price & date. Pbk 2005 at £5.99. Audio version also available.